Frosty mornings are now common, the Canada geese are arriving and the fall foliage is in various stages of color change throughout the state. Old man winter is beckoning off in the distance and soon will be knocking on our door. 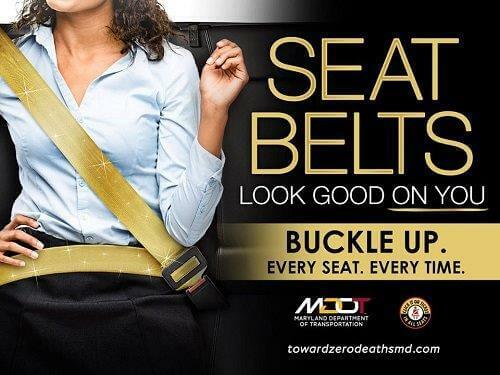 Colder weather will be here soon, so be sure to enjoy the outdoors during this special time of the year. Anglers continue to enjoy the results of the fall trout stocking program. Many trout management waters have been stocked and offer quality fishing, often close to home. Chesapeake Bay anglers are enjoying great success as fish feed heavily to prepare for winter conditions or to migrate out of the bay. With plenty of cool water and oxygen from surface to bottom, anglers can avoid waters with poor water clarity caused by recent, heavy rains. For tidal rivers and main bay areas, focus on areas with good structure such as underwater points, oyster bottom, reefs, channel edges, and large schools of baitfish. During lower light conditions, hungry rockfish will also roam the nearby shallow water areas looking for an easy meal. Temperatures will be cooler this week as another chance of rain rolls in on Friday and then again next Tuesday. Expect sunny to partly cloudy conditions most of the other days, with air temperatures in the mid to upper 50s and night-time temperatures in the 40s. At the At the National Oceanic and Atmospheric Administration buoys, water temperatures continue to cool, with Annapolis now at 57 degrees, Gooses Reef at 59 degrees and Point Lookout holding steady at 60 degrees. Water temperatures should continue to drop this week due to the cooling air temperatures. There is still poor water clarity on the main bay down to Swan Point and on the Potomac River down to near Colonial Beach. In addition, expect water clarity to decline localized and nearshore areas as another round of rain enters the area Friday. There will be above average tidal currents all week as a result of the new moon on Nov. 7. Wind and more wind with some rain tossed in – it’s been a typical fall pattern and we’re in for more this week. 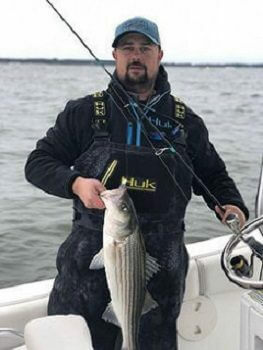 When things are calm, trolling is one of the most popular ways to entice striped bass of legal size, which are generally holding deep along channel edges. Surface water temperatures in the bay have dropped below the 60-degree mark and the tidal rivers are seeing water temperatures in the middle 50s or less. Most anglers are trolling with umbrella rigs with sassy shads or spoons, and using inline weights to get them down to the fish that are holding at 30 feet or more along channel edges. Single spoons, bucktails or swimshads can also be a productive part of a trolling rig behind a planer or inline weight. Since the bay waters tend to be a bit stained from recent rain events, chartreuse colors are a given. The deep channel edges of Love, Swan and Podickory points have been popular places to troll lately, but of course anywhere striped bass can be spotted on a depth finder is a good place to fish. As water temperatures continue to chill, some might find it frustrating to mark fish and get them to bite – that’s all part of the changing seasons. Once temperatures get into the 40s one almost needs to hit them on the head with lures. Jigging is a fall tradition and although most breaking fish being encountered are small striped bass, there is always the hope of larger fish lurking underneath. Large, soft plastic jigs in the 5-inch to 6-inch size range with pink or chartreuse have been popular, as have metal jigs. The Chesapeake Bay Bridge piers and the sewer pipe have been good structure to check for suspended fish. There is also some morning and evening topwater action in the lower regions of the tidal rivers feeding into the upper bay, mostly from Pooles Island and to the south. Poppers and crankbaits have been popular choices to cast near shoreline structure. The Susquehanna Flats area is experiencing stained conditions and will persist for the near future due to recent rain events. There are plenty of channel catfish active in the upper bay and anglers that are still chumming are encountering them when baits sink to the bottom. The white perch are going deep and small jigs or bottom rigs baited with bloodworms will entice them to bite. Generally they are holding over hard bottom in 20 feet or more of water in the lower sections of the tidal rivers. Trolling and jigging have been the two most popular ways to fish for striped bass. The water temperatures have dipped below 60 degrees and the fish are generally holding deep along channels. Bloody Point, Buoy 83, Thomas Point, the mouth of the Choptank River and the western edge of the shipping channel are all popular places to troll. A lot of people are trolling to cover a lot of areas, and to get down to the fish they are using heavy inline weights and umbrella rigs. Many anglers have marked fish holding in the depths but have had few takers on the mixed spreads of swimshads, bucktails and spoons they were trolling. We may be in for a couple nice days similar to this past Sunday — a real gift to fishermen after so many days of windy conditions. The waters were calm, skies were clear and the temperature warmed up nicely. Birds could be seen from far away and jigging underneath the surface action paid off for some with some large striped bass. Baitfish continue to exit the tidal rivers and often are swept along by stiff currents at channel edges, where striped bass tend to be suspended. Diving sea gulls often mark where striped bass of various sizes are chowing down, but look for gulls resting on the water or slicks, which can be a sign of fish below. In the lower sections of the region’s tidal rivers, white perch have headed deep and tend to be holding in the river channels over hard oyster bottom at this time. They can be spotted on a depth finder; either a bottom rig baited with bloodworms or a rig with a sinker and two dropper flies tipped with bloodworm will catch them. As we get close to December they will move to the deeper channels at the mouths of the rivers or out into the bay to settle down for the winter. Due to lower salinity from rain runoff, channel catfish will be found in the lower sections of the tidal rivers also. There continues to be a good shallow-water striped bass fishery in the lower sections of the tidal rivers and along bay shores this week. Casting topwater lures, jerkbaits, crankbaits or swimshads are all effective lures to use and it can be done from shore. Mornings and evenings offer the best opportunities, so if you pass some promising waters on your way to or from work, take some time and enjoy some casting. 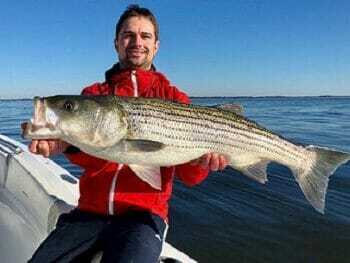 Trolling has been a popular way to fish for striped bass that are suspended at about 25 to 35 feet along steep channel edges in the lower Potomac and Patuxent rivers, as well as both sides of the main shipping channel in the bay. Umbrella rigs have been popular rigged with sassy shads or spoons with swimshad, bucktail or spoon trailers. Heavy inline weights are being used to get them down to the proper depths and a braided line helps a lot. Tandem or single spoons and bucktails are also part of trolling spreads and can be used with planers. Chumming is still an option in the lower Potomac near the St. Georges Island channel edge and the mouth of the river. Jigging is also a great light-tackle option when larger striped bass can be found suspended along channel edges or under breaking fish. Most often the surface fish that are chasing bait are sub-legal striped bass. Use 1-ounce jig heads with 5-inch to 7-inch soft plastics in a variety of colors such as pink, pearl, purple or chartreuse and a combination of those colors. The lower sections of the Potomac, Patuxent rivers and Tangier Sound have been good places to look for action. There are good casting opportunities in the morning and evevning along shoreline structure in the lower sections of the tidal rivers on both sides of the bay. Casting topwater poppers is a fun way to fish, as is using swimshads and crankbaits. The eastern side of the marsh banks are great places to fish, along with points, rocks and piers on the western side of the bay. White perch have moved out of the shallower creeks and tidal rivers and are holding in deeper channel areas over oyster bottom. Bottom rigs or dropper fly rigs tipped with pieces of bloodworm are good way to catch them. Fishing for blue catfish has been good in the Potomac River from the Route 301 Bridge north and in the Patuxent and Nanticoke rivers, with channel catfish added to the mix. Many streams and rivers in the western and central regions are experiencing high water flows due to recent heavy rains, and caution should be the first order of business. The upper reaches of smaller streams will calm down rather quickly but some areas such as the upper Potomac will be running dangerously high for a while. Cooler water temperatures at Deep Creek Lake are just what walleye prefer and anglers are finding them along grass lines and rocky edges in relatively shallow water. Drifting minnows or casting minnows on a jig head is a great way to catch them along with large yellow perch. Casting jerkbaits at dusk is another good tactic along these same areas. Northern pike are moving into the mouths of some of the larger and grassy coves. Smallmouth bass can be found along rocky points and transition areas leading to deeper water. Crankbaits resembling crayfish are a good lure choice for the smallmouth bass. 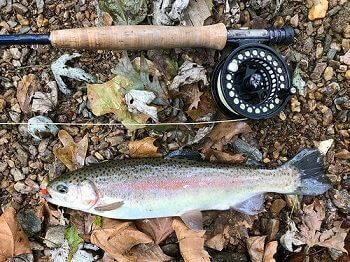 The department has finished fall trout stocking and many of the trout management waters still have plenty of trout to entertain fishermen. The western and central region waters may be running high but smaller streams will calm down fairly quickly from recent rains. 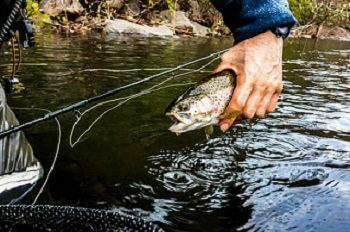 The catch-and-release and fly-fishing-only management waters hold exciting and fun fly rod fishing. Fishing for largemouth bass continues to be good in many areas around the state. 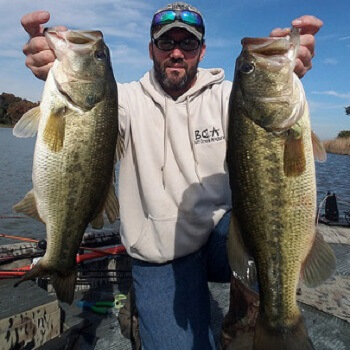 Everything from small farm ponds to reservoirs and tidal rivers are great places to fish as largemouth bass feed heavily in preparation for the winter months. Target transition areas between the shallow areas where grass vegetation is declining and deeper waters where there is cover such as sunken wood or rocks. Crankbaits and jigs that resemble crayfish are a good bet and spinnerbaits, jerkbaits and grubs are good choices to mimic baitfish. As grass beds decline and waters get colder, fishing for chain pickerel really starts to kick into gear. They can be found in a variety of waters in Maryland ranging from small ponds to the largest tidal rivers. Fishing conditions in the Ocean City area have been a little rough lately. Surf fishermen have been enjoying some fun action with small bluefish and the tail end of the kingfish season. The bluefish are being caught on finger mullet and cut baits — pieces of bloodworms on a bottom rig are the ticket for kingfish. The fall run of striped bass is still far north, barely entering the northern end of New Jersey. At the inlet and Route 50 Bridge a few sheepshead are still being caught at the South Jetty, but they will not last much longer as colder water pushes them south. There are still some flounder moving through the inlet headed for offshore waters. Casting and working Gulp baits along the bottom or drifting traditional baits is the best way to catch them. The channels leading to the inlet such as the East Channel are good places to target. Striped bass are being caught in the inlet and near the Route 90 Bridge on a variety of lures. Bucktails dressed with a twistertail, topwater lures, swimshads and jerkbaits are all good choices. Most of the fish are less than 28 inches but offer a lot of fun catch-and-release fishing. Outside the inlet, flounder can be found on some of the inshore lumps and shoals, and especially near the wreck and reef sites farther offshore. Fishing boats are catching limits of sea bass and flounder with a mix of triggerfish and bluefish. Offshore waters have been pretty rough lately and so far there has not been any reports of Bluefin tuna passing through our waters along the 30 Fathom Line, but it is about that time. Four to five decades ago we would experience a run of bluefins from 400 pounds to close to a 1,000 pounds right before Thanksgiving off northern New Jersey. It was some amazing fishing, something like hooking up to a truck speeding down the turnpike — it would be exciting to have an active fishery like that in the mid-Atlantic again.